Welcome to Bikeskool Rider Training! If you’re going on to do your full test, you will need to pass the theory and hazard perception test. Along with a CBT, your pass certificate is valid for two years. The theory test and CBT can be taken in any order. You will be asked questions about the highway code etc and also shown various clips of actual motoring scenarios; the object of the exercise is for you to spot the hazards as soon as possible when they occur. Many riders find doing CBT first beneficial when doing their theory test. The theory test will gauge your knowledge and understanding of riding theory. A sound knowledge of the theory is essential for a better understanding of practical riding skills. To help you learn the theory there are several training aids available, books, CD-ROMs and at Bikeskool Theory training sessions. All driving licence-holders have to pass the theory test before a booking for a practical test can be accepted. Theory tests are available during weekdays, evenings and on Saturdays. ALL RIDERS, INCLUDING FULL CAR LICENCE HOLDERS, MUST SUCCESSFULLY COMPLETE THE THEORY AND HAZARD PERCEPTION TEST BEFORE PROGRESSING TO THE PRACTICAL TEST. Please be aware that if you have an old style paper driving licence then you will need your passport for evidence of identity. 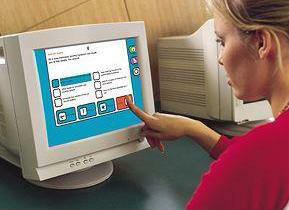 The 40-minute test, taken under exam conditions, consists of multiple choice questions. Most questions ask you to identify the correct answer from a choice of four or five possible options. There will also be some multiple response questions that will ask you to select several answers from five or more options. Some questions will contain pictures of road signs or road situations. To pass the test you will need to answer at least 30 out of 35 questions correctly. You will take the test using a computer screen. You will select your answers by simply touching the area of the screen that shows the answer of your choice. No previous computer experience is required. You will have up to 15 minutes to get used to the system before starting your test. There will be staff available to help if required. The screens are easy to read and only one question will appear on the screen at the time. You will be able to move forwards or backwards through the questions at any time to look at the questions again to complete or to alter your answer. The new system will inform you if you have not completed your answer fully. At the end of the test your answers will be calculated and you will be given your test result. It is recommended that you buy a book which contains all the questions and answers, which are in the same format as in the actual test. There are now over 1000 questions that the test centre has in its question bank. Candidates with special needs will have additional time and assistance – e.g. hearing the written text through a headset. The test is also written or spoken in 15 other languages. We are happy to offer FREE advice on booking, or to book your Theory Test for you as part of your course. Click here to try a practice theory test online! Click here to book your theory test now! Research has shown that the more experienced riders and drivers scan the road better and recognise much earlier the clues that show a hazardous situation is developing and therefore start to take action before the danger occurs. The DSA have now extended the Theory Test by adding a Hazard Perception Test. It’s taken at the same time as the Theory Test and takes about an extra 15 minutes. During the test candidates are shown a number of moving video clips filmed from the motorcyclist’s point of view. Each clip contains one or more developing hazards. The candidate will be asked to indicate as soon as they see a hazard developing which may result in the motorcyclist taking some action, such as changing speed or direction. The sooner a response is made the higher the score. The pass mark at the time of writing (September 2005) is 44 out of a possible 75.